1. All our volunteers are unpaid. 2. Most of our funds come from subscriptions, donations and fundraising ie fairs, street collections, and our two charity shops in Derby and Wirksworth. 3. You can help simply by just becoming a member of the branch but, if you wish to help in a practical way, you may consider becoming a fundraiser, jumble collector, shop assistant, cat-line operator, cat transporter ('vet runner'), or perhaps in some other way. 4. To become an active volunteer, you will be required to become a member of the branch. 5. Brief descriptions of the above roles are given below. 6. Further information on any of the roles will be given by the branch co-ordinator (or his/her designated deputy) when you take on any role. 7. We hope you will appreciate that we are governed by the rules of our charity and we have put the interests of the cats first. 8. Remember that volunteer work can be very demanding at times and it is essential that you have the full support of the rest of your household. Fundraiser: helps set up and run stalls at fairs, rattles collecting tins, sells Cats Protection goods, etc. Shop Assistant: helps in the charity shops located in Derby and Wirksworth on a regular rota basis, sorting, stacking and selling items of clothing and bric-a-brac donated by the public. Cat-Line Operator: takes messages off the answering machine on a rota basis on their own phone at home and then passes the messages on to an appropriate volunteer, or rings the of the public with theadvice they need. Cat Transporter (Vet Runner): transports cats to and from the vets for various reasons, ie injury, neutering/spaying, etc. They also pick up cats from members of the public and transport them to our various foster units. Fieldworker:does a similar job ro a vet runner but this job also includes the humane trapping of 'difficult to handle' cats, attending road traffic accidents, etc. Here is a photo of our wonderful Catline volunteer crew. As they are normally only in touch with each other by email or phone, they meet up a few times a year for a coffee and a natter to put faces to names. They are the most caring and sensible people, being on our frontline and having to deal with all the sad and heart rending calls they get on a regular basis. Please join with us in thanking them most sincerely for all they do for the cats and humans too. If you are considering becoming a volunteer, we look forward to hearing from you. Your donations, no matter how large or small, will make a huge difference to the lives of the unwanted cats and kittens in our care. Without you we simply wouldn't be able to continue our valuable work. Thank you for your support. Become a member or if you are already a member, why not subscribe a friend or family member as a gift. Remember, we also offer a junior membership scheme for young people aged 18 years or under. 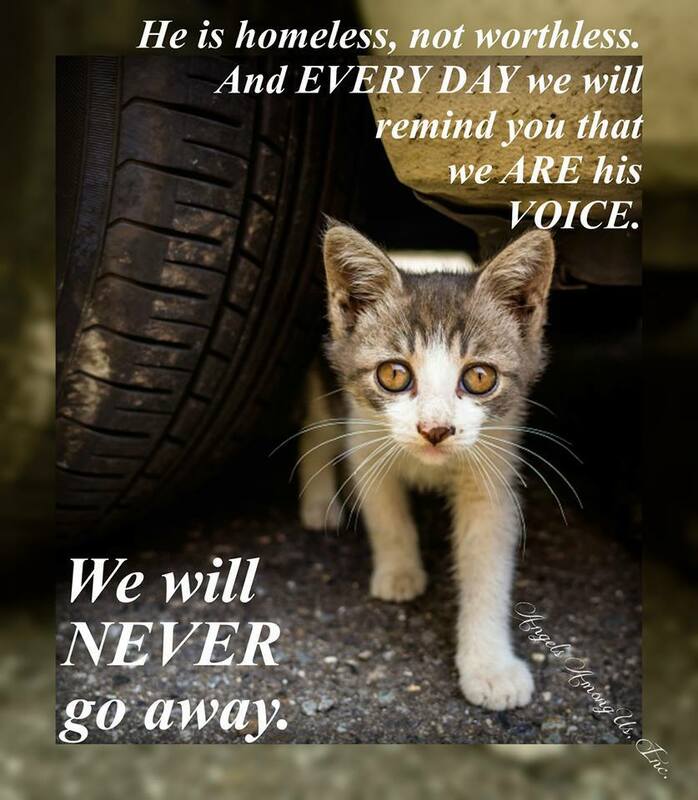 Quarterly news of the cats occupying the pens at our various foster homes throughout the area, together with photograph(s) of one or more cats living in the pens. Quarterly copies of "Dandi", the Derby and District Branch newsletter. Acknowledgement of your sponsorship (new or renewal) in the next issue of "Dandi". If you choose to sponsor a pen as a gift, the recipient will receive a card notifying them of your gift, followed by the items above. The annual donation for sponsorship is £17.50 per pen. If you wish to sponsor three or more pens the cost is reduced to £15.00 per pen. Download a Sponsorship Form or email pensponsorship@derbybranch.cats.org.uk for further information. If you donate money, become a member or sponsor a pen and you are a UK taxpayer, please take the time to complete and return a gift aid form. This enables us to claim back 28p in every £1.00. Please remember us if you have any good quality bric-a-brac that you would like to donate, if for instance you are having a clear out or moving house. You can take any unwanted items to either of our charity shops (at Derby and Wirksworth). We regret that we are unable to accept electrical items. If you have any broken, unwanted jewellery please don't throw it out, donate it to the Branch by taking it to either of our charity shops. We are able to raise funds for the Branch by selling the silver/gold as scrap. 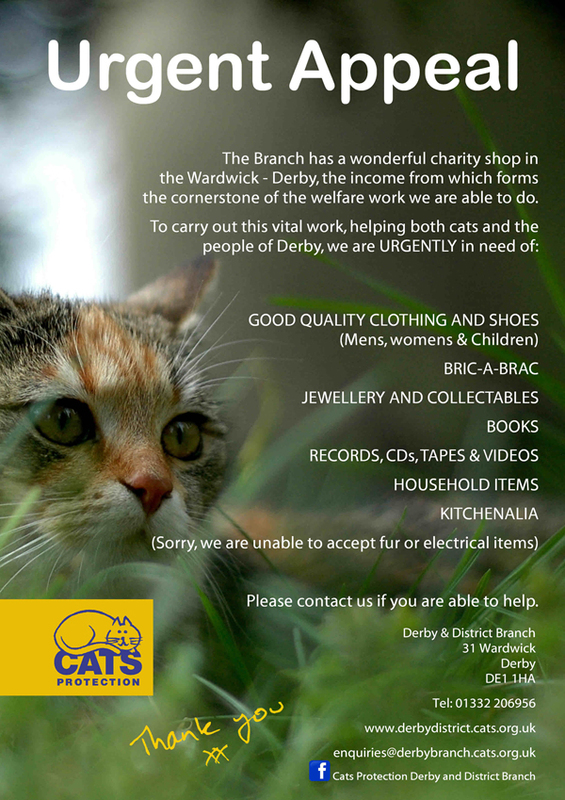 We are often asked by animal lovers how they can leave a certain amount of money to Derby and District Branch to ensure that the bequest goes to the Branch alone, which is based at 31 The Wardwick, Derby. One way of doing this is to set up a Trust Fund of your chosen amount of money, requesting your solicitors to act as Trustees. This amount could be specifically identified for, say, neutering or veterinary costs. The Branch could then approach the Trustees at regular intervals to request the release of funds to carry out these procedures. For further information, please discuss this with your solicitors and the Branch. For full details about how to remember Cats Protection in your will and to receive a free ‘Gifts in Wills’ booklet visit www.cats.org.uk/giftsinwills. A dedicated ‘Gifts in Wills’ team is on hand to answer any queries via giftsinwills@cats.org.uk or Tel: 01825 741 271.